Click on the photograph to open a large version in a new window. 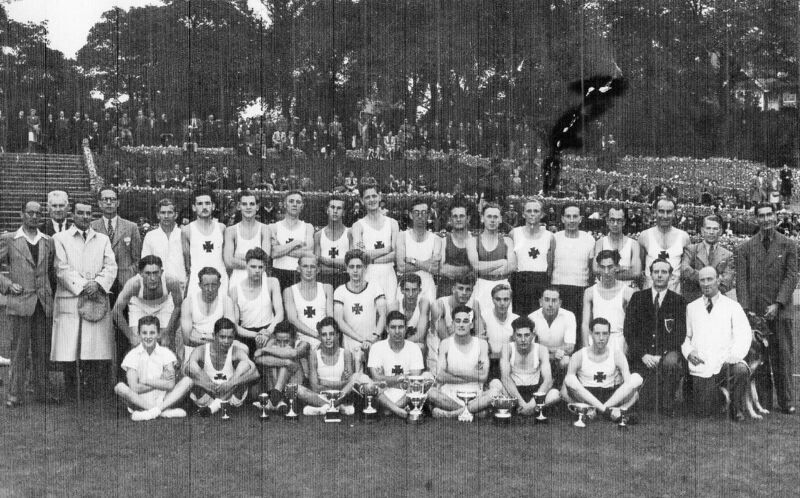 This athletic group was originally called the Brighton and County Harriers, but then it was changed and we became the Brighton Athletic Club. I am not entirely sure, but I think the year was about 1946; it was taken in Preston Park where we trained. We changed in a pub or a house over the road. Of course in those days, our facilities were pretty basic; there was just a sand pit for high and long jump, not like today where they are separate. We also shared the track with a cycle club. We used to have meetings with other clubs such as Worthing and South London. My events were high jump and javelin. I gained a bronze and a silver award for javelin at the Sussex Championships. I am afraid I cannot remember any of the member’s names; it was a long time ago and my memory is not that good. In later years we moved our headquarters to the Greyhound Stadium in Hove.